True Confession. I am TERRIBLE when it comes to mastering crock pot recipes. Until recently! I have been writing enough recipes to see a trend that has inspired me to actually dust off my crock pot and used it twice this last month! That is huge for me since I am pretty sure I have only used it three times since the Olympics were held in Sydney. Yeah. That long ago. But the trend I have been seeing are the best recipes out on the internet. Super savory dishes that have a sauce element seem to win hands down. Not just the standard onion soup mix with water, but actual enchilada, mushroom soup, or bbq sauce. I think it helps to break down the meat and infuse it with flavors verses having to dip or dredge them though sauces. And the meat is so tender you can cut it with a fork. This Hawaiian Barbeque is perfect for a luau, or just chillin at home with a great book. Just because you are home doesn’t mean you need to spend all your time in the kitchen, it is time for ho`ohau`oli which means to have fun in the Hawaiian language. This is what Nicole of The Salty Marshmallow has to say about this super simple kick back recipe! Quick Tip: If \would like to add some diced bell pepper and onion the last 30 minutes of cooking that would be totally fine. 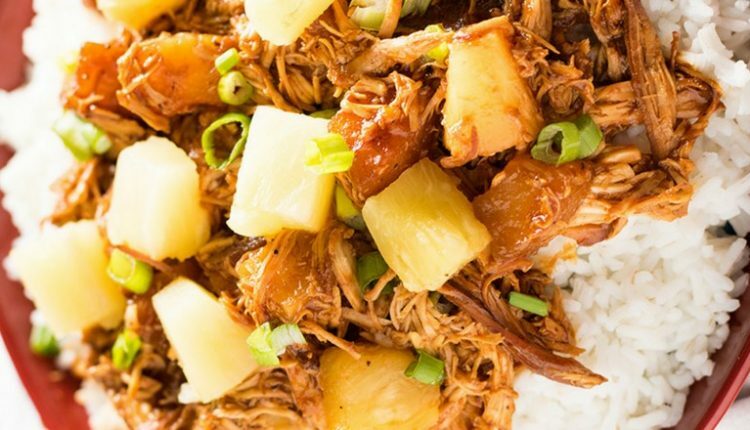 bbq sauceChicken BreastsGarlic MincedPineapple ChunksriceSalt & Peppersoy sauceWhat Happens When You Combine 5 Ingredients in your Crock Pot And Leave It? Magic.